Lots of us focus on “defying” aging, but why not embrace? By focusing on youth we overlook the beauty, wisdom, and grace that comes from the aging process. Since September is Healthy Aging Month, this month let’s take the opportunity to embrace aging in a healthy, mindful way. Feel confident about aging does have its obstacles. We are constantly bombarded with beauty commercials telling them to “keep our youth,” and many older people are subjected to ageism. In fact, an AARP study found that 64 percent of Americans workers have seen or experienced age discrimination in the workplace. Unfortunately, if we internalize these negative messages it can lead to negative health consequences. The North Carolina State University stress study is one example of how a negative attitude about aging lead to health problems. 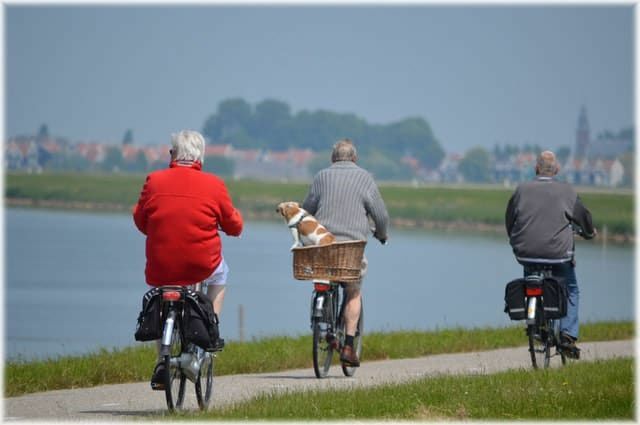 The university researchers studied aging attitudes in older adults, and they found that individuals with negative perspectives about aging experienced more emotional fluctuation when stressed than participants with positive outlooks. Negative attitudes not only impact stress, but can also hurt a person’s self-esteem and sense of happiness. Let go of those negative messages and celebrate Healthy Aging Month with these helpful tips. Is getting older giving you the blues? Take a moment, sit down, and list all the great things you have achieved in your lifetime, including milestones from your family life, career, hobbies, and community activities. And while you’re at it, create another list of all the goals and accomplishments you can achieve with your years of experience and hard-earned lessons from life. By using mindful thinking you can re frame your mind and celebrate the beauty of aging. Scheduling regular doctor appointments, eating healthy meals, and getting enough sleep and regular exercise are a must for proper body care. It’s also important to be kind to yourself. When you start noticing physical changes in your body, such as a wrinkle, embrace this change instead of becoming remorseful. Many of us schedule regular physical checkups but fail to do the same for mental health checkups. So, consider scheduling an annual appointment with a psychologist. You can also protect your mental health by playing memory games, learning new skills, or taking up new hobbies. Looking after the health of your soul is also important, especially as you get older. Schedule regular talks with a spiritual adviser that you trust. Listen to music or read books that feed your soul. Also, consider participating in community service programs that make your feel fulfilled.